Creating old world charm or a contemporary flare to your walkway or patio is simple with the help of Blooms Landcare. Here you can find some options of pavers, including driveway pavers, concrete pavers, brick pavers and more. Our team can help you create an attention-grabbing driveway, patio or walkway. Our pavers are offered in a number of tones, shapes, and styles to help you create the right charm and personality to transform your outdoor living spaces. In addition to outstanding style, Blooms Landcare’s concrete brick pavers have been designed to be durable, strong and eco-friendly, ensuring your patio or driveway will withstand the test of time. …and so much more. We can also combine any style with any application you need, creating a unique space that is all your own. When you call Blooms Landcare for paver installation, our friendly staff will walk you through the process one step at a time. We have a team of paver installation experts who can assist you in all aspects of creating your landscaping masterpiece! Once this initial consultation is complete, the job is ready for preparation. We will thoroughly prepare the area to be paved. We will excavate the top layer of the land and smooth any unstable areas. This will allow for a proper paver base material to be installed. Paver base materials will be laid with proper restraints to prevent the pavers from separating or spreading. A layer of paver sand will then be placed to fill in any holes and ensure a smooth finished product. Paver stone or brick would also be installed to your specifications. How much base is needed for pavers? Determining the amount of base you will need for your pavers is crucial. Without the right foundation, you are setting yourself up for paver failure. The most commonly accepted ratio is 4-inch base of 3/4 inch quarry process or RCA beneath a 1-inch layer of concrete sand. When you are trying to calculate just the amount of material you will need, you first need to understand how each material is measured. Crushed stone, the recommended material for paver base is measured in cubic yards. For crushed stone: multiply your square footage by .01235. For sand: Use the square footage measurement that you received from the stone and multiply by .00309. That will provide you with the measurement that you will need for your base. If you have questions or need assistance, don’t hesitate to call Blooms Landcare at (817) 688-5352 today! How much does it cost to install pavers per square foot? We understand that you have a budget to stick to when it comes to your landscaping. Installing pavers can be very affordable. 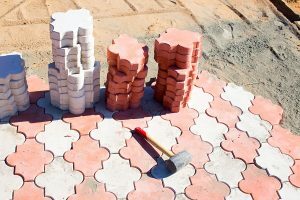 Generally, you can expect to pay anywhere from $3-$15 a square foot depending on the materials you choose and the area you are looking to place the pavers. While the materials play a large part in the cost, the intricacy of the pattern can also cause a price increase. The best way to get an accurate estiamte in how much your pavers will cost is to talk to our landscaping professionals at Blooms Landcare. Contact us at (817) 688-5352 to talk about your landscaping goals. Blooms Landcare specializes in high-quality paver installation. What distinguishes us from other paving companies is our highly trained staff. We hold several certifications, including certifications from ICPI and Techniseal. ICPI certification ensures that our concrete pavers have all the necessary knowledge to produce a top-tier product while complying with all industry guidelines. Techniseal Certified Applicator Program is a specialized course on cleaning, sealing, and joint stabilization of pavers. We invest heavily in our pavers to bring our clients the best end result possible. If you are in need of professional paver installation, call Blooms Landcare at (817) 688-5352 to schedule an appointment with us today.